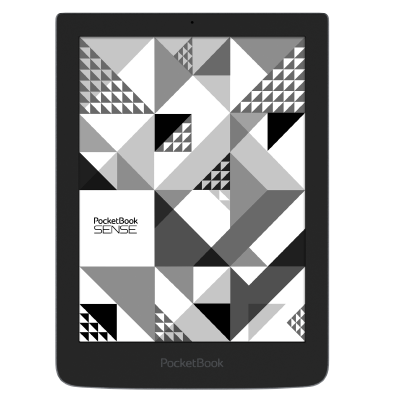 PocketBook presents its exclusive fashion e-reader PocketBook Sense with KENZO cover, which combines the latest trends “in vogue” and high functionality. The new premium 6-inch E Ink reader PocketBook Sense with KENZO cover will be presented in set with the exclusive accessory developed together with a recognized trendsetter - a world-renowned brand KENZO. The new e-reader will complement even the most sophisticated image, emphasizing the intelligence and attractiveness of its owner. While creating a premium fashion-model PocketBook engineers and designers were guided by "useful in beauty" philosophy. Narrow margins around the screen give the device its special elegance. Reader is made in two colors with «cool gray» - the deep shade of gray. Paging buttons are located on the rear panel that allows to turn pages comfortably while holding the device with one hand. Smooth lines, sleek shape and high quality implementation make PocketBook Sense with KENZO cover the most anticipated novelty in the world of “haute couture” of e-reading. Luxurious black cover with crocodile-like embossment perfectly fits unique reader’s shape. Glossy surface gives pleasant tactile sensation, so, you don’t want to release the device from your hands. Soft inner lining protects screen from external influence. PocketBook Sense with KENZO cover is equipped with E Ink Pearl screen with HD resolution of 1024×758 and 212 dpi. A built-in light-sensor will automatically adjust the frontlight depending on the ambient conditions, which would make the reading process even more enjoyable. Powerful 1000 MHz CPU of PocketBook Sense with KENZO cover allows to turn the pages quickly and smoothly. The e-reader supports 19 popular text and image formats and provides a set of pre-installed ABBYY Lingvo dictionaries, which makes it easy to read books even in a foreign language. 4GB of built-in memory plus a microSD slot will be enough to keep even the largest collection of favorite literature. Using the device is simple and, which is more important, incredibly comfortable due to the multi-sensory display and the new PocketBook user interface. Access to the Internet via built-in Wi-Fi opens up limitless opportunities not only for reading, but also for social networking using via ReadRate service. The pre-installed Dropbox and Send to PocketBook services allow to transfer content to the device without connecting to a PC. Meet PocketBook Sense with KENZO cover - the fashion trend-setter of the e-reading market, and remember: there is nothing more seductive and compelling than intelligence.